Ok, I was going to save this card for later but the challenge I made it for ends today (I think), so you get a bonus post for today. I hope everyone's Sunday is going well! 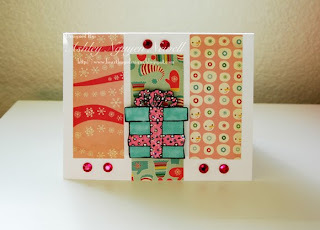 I made this card using the CardPatterns sketch 43. The stamp I used is QKD Fantasy Gift Stamp. It's super versatile since I can use it for any occasion. The paper is Jolly by Golly from Cosmo Cricket. The rhinestones are Studio 18. And I covered the "ribbon" in Crystal Stickles. Love that CC! Your card is so cute! I was just eyeing that challenge! YOu did a FAB job! Have fun with the QKD! Off to comment on your others! wooohooo, congrats on the super six! Congratulations. 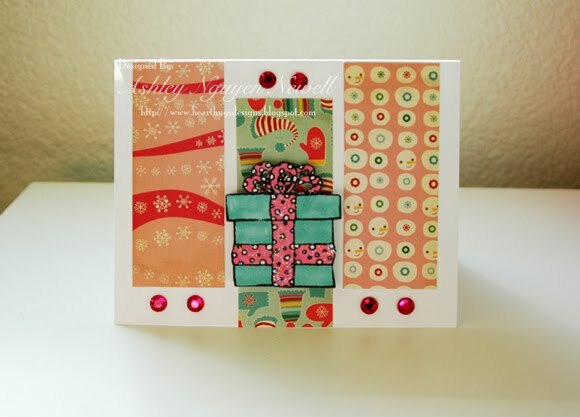 Love your vibrant, cute Christmas card.